My friend and I were talking about books recently, and she said something about how a lot of the things I had been reading lately sounded very depressing. And I sometimes ask myself why I would want to read something about someone’s pain and hurt, which is a question that I can’t always answer, but it often boils down to the fact that the subjects surrounding this pain is usually one of importance, or perhaps despite all the sorrow there is also a piece of hope within these stories that makes you think that maybe not everything is hopeless. I would say that The Kite Runner perhaps lacks a bit of that hopefulness in some ways, but ultimately touches on some very real, very human topics which make it fall into the category of importance through it’s powerful emotions and subject matter. I can’t remember much about when the book first came out, but I remember when the film adaptation was in the works, and a little piece of the controversy surrounding the safety of the actors afterwards. I never really wanted to watch or read it at that time, but the book has always stayed on my radar as something I really should get to one day. And so, much like my previous review for The Color Purple, no time like the present! 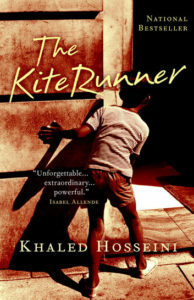 The Kite Runner is told from the point of view of Amir, who we first see as a young boy in Afghanistan, in a time shortly before the Soviet military intervenes within the country. Amir has a complicated relationship with his father, always struggling to live up to his expectations, and wondering if his father truly loves his best friend, Hassan, almost as much as him. Hassan is the son of the family’s long-standing worker, and throughout the beginning of the novel we see the friendship between Amir and Hassan, as well as Amir’s struggle with jealousy of his friend in some ways, despite being of the more privileged status. But sooner rather than later, a traumatic incident occurs which begins to tear apart the friendship between the two boys. And this is just the first in a whole number of horrible events which follow through the rest of the book, as the political conflicts and fighting in the country end up with Amir and his father travelling to America, while Hassan and his father stay behind. As Amir grows up and he and his father try and find their place in this new country, there is a huge sense of loss for their old way of life and for their home country, but more than that, Amir struggles with an overriding guilt because of what he did and how he acted as a young boy towards his friend during a time when he could have done something to help. But now, faced with the opportunity for redemption, what will he choose to do? Khaled Hosseini weaves a beautiful depiction of Afghanistan in his writings, but also doesn’t shy away from the issues present in terms of racial/religious discrimination, nor the political unrest and ultimate involvement of the Taliban in the country. But more than that, he creates a story of human depth and how trauma can affect us in so many ways that endure over time. The sense of guilt that Amir holds on to sneaks up in everything, and even when faced with the chance to perhaps make things better, it’s not all that simple in the end: the world is full of horrible things that happen, and even though we try our best to make things better, it’s not always possible, or there is red tape that gets in the way. Though I said this novel lacks some of that sense of hope that other heavy novels I’ve read recently hold on to, it does have a small spark of it at the end, and it is enough: something more might have seemed out of place, to be honest, and even in saying that, I realize that there already seemed to be a few lucky breaks in the final parts which allow things to tie up a bit nicer than they may have in reality. So, in the end this was definitely a tough book to get through on an emotional level, and at times it felt like the tragedy was being laid on a little too thick. But who is to say this isn’t the reality for a lot of people in different places in the world? In that way, this novel felt incredibly human, and got right into the recesses of my heart. Share the post "“It’s Wrong What They Say About the Past, I’ve Learned, About How you Can Bury it. Because the Past Claws its Way Out.”"
Heading into my 7th year participating in Cannonball Read with CBR11! Catch me doing most of my reading while waiting for customers to come in to work. Great review. I really enjoyed his second novel, A thousand splendid suns, if you decide to read more of him.